Swoopster really utilizes the iPad's entire surface, to put awesome sound effects manipulation at your fingertips. If that's not enough, just tweak the sound effects, and pick up your guitar. With Audiobus and IAA intergration the possibilities are endless. Don't second guess, just get it. This app is another brilliant app from Holderness Media (makers of Echo Pad). Small size, but huge on sound. The presets alone are great, but playing with the X/Y pads or going into "Tweak" mode gives you so much more. Easy recommend on this app. Great app! Simple to use, zero learning curve and pro quality effects. A steal at twice the price. is a wild, fuzzed out performance flanger designed for Audiobus and Inter-app audio. 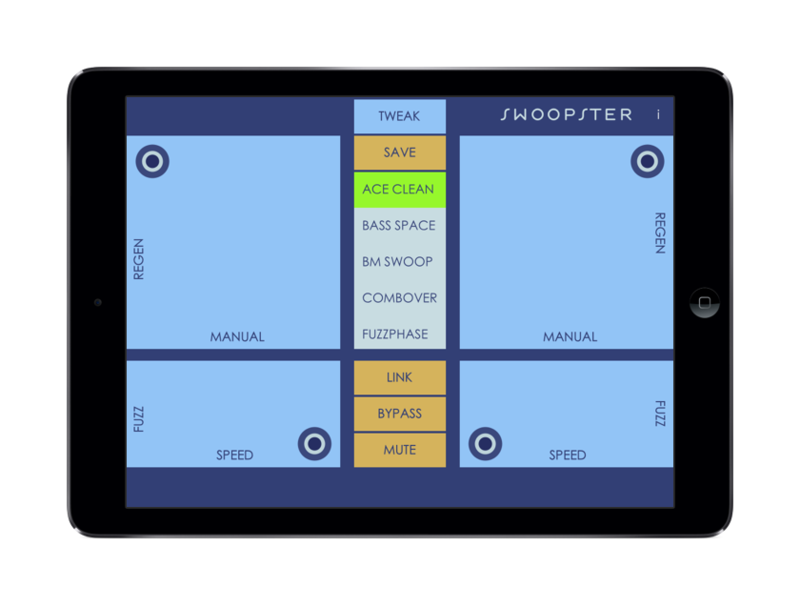 Process synths, drum machines, guitars and hundreds of Audiobus compatible apps through Swoopster's stereo effects. Use Swoopster as an Inter-app audio effect in Garageband, Auria, Cubasis, AudioShare and more.